Since my garden plot is still frozen solid and lying under a sheet of ice, I opted for purchasing tomatoes and cilantro instead of waiting for my homegrown veggies to be ready. 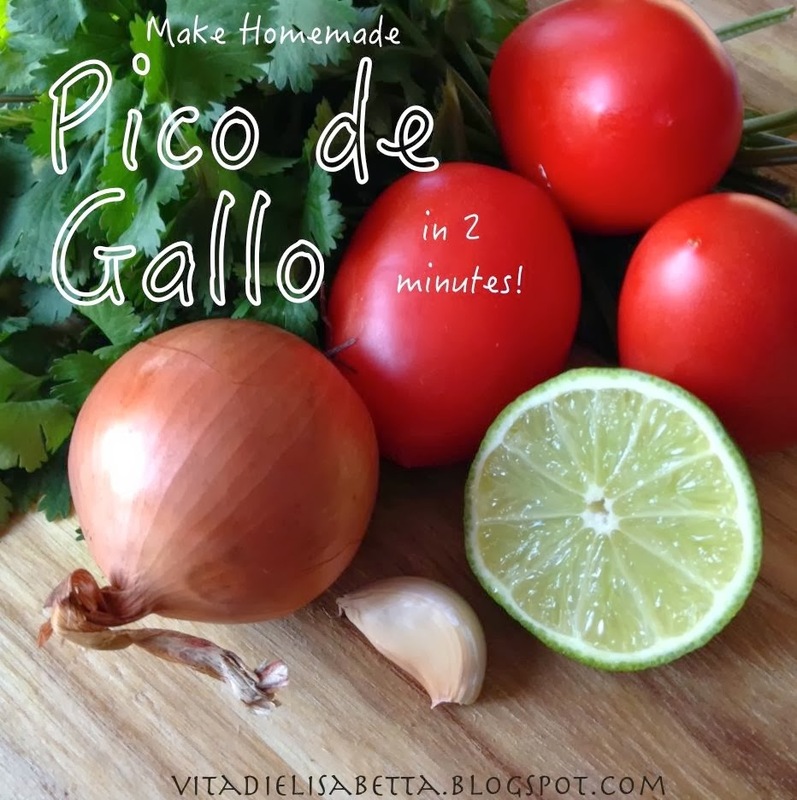 Gather your ingredients – tomatoes (a meaty variety is best, like roma or beefsteak), onion, garlic, cilantro, lime, salt, and pepper. 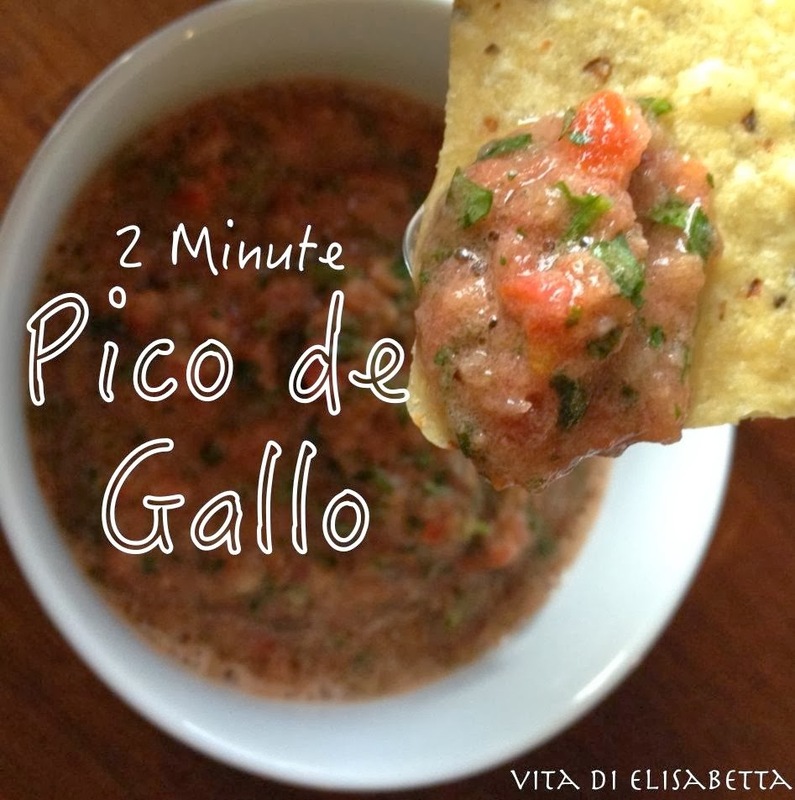 Slice the tomatoes in half and gently squeeze out the extra juice so your pico isn’t too watery. Coarsely chop the tomatoes, onion, and cilantro and throw it all into your blender (or food processor if you have one) along with garlic. Squeeze the juice of one lime over it. The last time I made this, I had forgotten to buy a lime. People, learn from my mistakes — do not forget the lime! That citrusey goodness just brings all of the flavors together into a summery explosion in your mouth. Ahem, lime is good. Use it if you can. Throw a little fresh jalapeño in there if you like it hot! Cover you blender and pulse to blend it until it reaches the desired consistency. Add salt and pepper to taste. Taste. Taste. Grab a bag of chips and keep tasting! 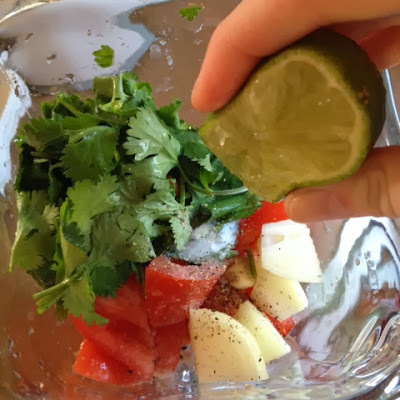 Coarsely chop the tomatoes (squeeze out extra water), onion, garlic, and cilantro and throw into a blender or food processor. Squeeze the lime over the veggies. Pulse until veggies are chopped to desired consistency. Add salt and pepper to taste. Ooooh my tongue is all tingly now! LOL!! I would take chips and salsa over chocolate cake and brownies ANY day!